On the heels of kicking off their new Writers Residency program, where writers can ride intercity passenger rail for free, Amtrak welcomed 30 prominent new media “influencers” on a long-distance train ride from Los Angeles to SXSW in Austin. The new initiatives are part of a larger effort by Amtrak to connect with a demographic they believe is already open-minded and passionate about intercity train travel. Monte Verde says that the 30 participants had somewhere around 2.5 million followers on social media, and that the group logged their journey by using the #AmtrakLive hashtag. The major takeaway for many of the participants, however, was the relaxing nature of the ride, and scenic beauty of the trip. 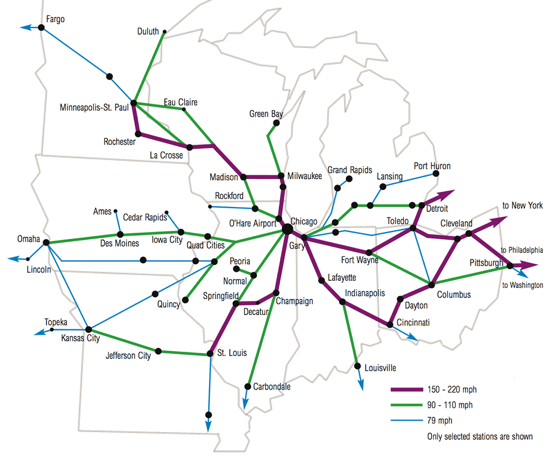 Amtrak is currently in the process of upgrading intercity passenger rail service in the Midwest between St. Louis and Chicago and Detroit and Chicago. Segments of those routes are now operating at 110 miles per hour, with additional upgrades underway to bring the entire length of those routes up to higher speeds. In October 2013, Amtrak officials signed an agreement with the State of Indiana to maintain Hoosier State service, and revisited the idea of improving service between Cincinnati and Chicago.